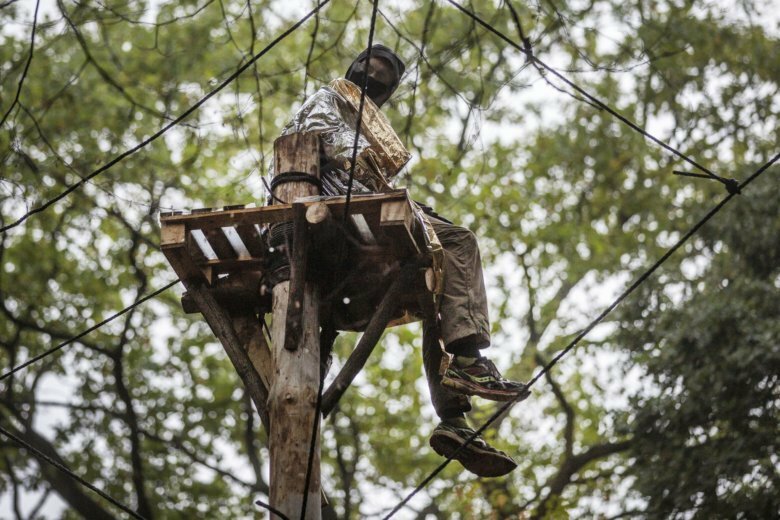 Police were hoisted on platforms by cranes to the up-to 25-meter (80-foot) high tree houses constructed on wooden tripods in the forest’s canopy. Activists rejected as “ridiculous” local authorities’ contention that the homes constituted a fire hazard. “Through this form of protest we are taking our future into our own hands,” he said. Greenpeace spokeswoman Gesche Juergens appealed to Chancellor Angela Merkel to step in, saying expanding the coal mine was counter to her plans to reduce the country’s reliance on fossil fuels, and that the removal of the protesters could jeopardize talks between the government, environmental groups and others. “Merkel must not allow a possible compromise in the coal question to be hindered by further escalation,” Juergens said.